upper left in brown ink: 230; lower right in brown ink: Dom Tiepolo f; lower center verso in graphite: D. Tiepolo del. 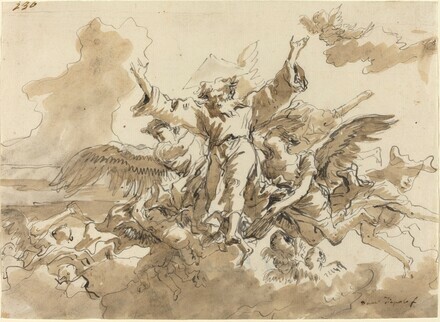 Domenico Tiepolo: Master Draftsman, Indiana University Art Museum, Bloomington, 1997, no. 86, as The Almighty. In the Beginning: Artists Respond to Genesis. Contemporary Jewish Museum, San Francisco. San Francisco, 2008, 18, 32, no. 1.